"Extreme Unction", part of The Seven Sacraments, by Rogier van der Weyden (1445). Anointing of the Sick is a sacrament (a sacred ceremony) in Roman Catholicism and other Christian denominations. It is given to people who are "in danger due to sickness or old age". A person does not have to be dying to receive the Anointing of the Sick. It can be done for anyone with a medical problem which they could die from. All four Gospels in the Bible say that Jesus healed many people. Catholics believe that even after his death, Jesus is still able to heal people through the power of the sacraments. The main part of the Bible that talks about anointing of the sick is James 5:14–15: "Are any among you sick? They should call for the elders of the Church and have them pray over them, anointing them with oil in the name of the Lord. And their prayer offered in faith will heal the sick, and the Lord will make them well. And if they have committed sins, these will be forgiven." Matthew 10:8, Luke 10:8–9 and Mark 6:13 also talk about the anointing of the sick. 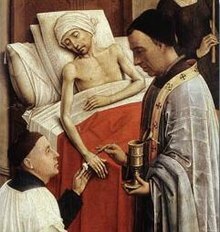 The Anointing of the Sick sacrament is done by a priest. The priest brings oil, which he has blessed. Usually, the oil is olive oil or another pure plant oil. The priest rubs the blessed oil on the patient's forehead, and sometimes other parts of the body. While he does this, he says special prayers that are meant for the Anointing of the Sick sacrament. Several other Christian churches have similar rituals. Lt. Cmdr. J.T. O'Callahan gives last rites to an injured crewman aboard the USS Franklin, after the ship was set afire by a Japanese air attack (1945). The Anointing of the Sick is one of the three sacraments that make up the last rites. In Catholicism, last rites are a set of sacraments that are given to people who are dying. Penance: The dying person repents their sins (says they are sorry for the sins they have done), and asks God to forgive them. Viaticum: This is one final Holy Communion. The dying person is given a small piece of bread, or even a tiny crumb if they cannot eat. A priest has blessed this bread. Catholics believe this special blessing turns the bread into the body of Christ. ↑ "Code of Canon Law, canon 1004". Vatican.va. Retrieved 2014-07-29. ↑ "Catechism of the Catholic Church, 1514". Vatican.va. Retrieved 2014-07-29. ↑ "Seven Sacraments of the Church Compendium of the Catechism of the Catholic Church, 319". Vatican.va. Retrieved 2014-07-29. ↑ "Anointing of the Sick". Catholic Answers. Retrieved 2014-07-29. ↑ "The Sacrament Of Anointing Of The Sick". Papalencyclicals.net. Retrieved 2014-07-29. ↑ "Sacramental Guidelines" (PDF). =Diocese of Gallup. This page was last changed on 4 June 2018, at 03:13.